Very nice ornamentals and succulent bonsai that develops a much-prized large and beautiful tunk. Description: The Crassula cv. 'Gollum' is a very compact plant considered a hybrid of C. x portulacea by some experts. (a supposed cross between Crassula argentea and C. lactea). This is a similar cultivar to the earlier Jade cultivar 'Hobbit' but where 'Hobbit' leaves are curled back around, while the cultivar 'Gollum' has leaves that are nearly tubular and appear to be tipped with a suction cup reminiscent of the J.R.R. Tolkein character by the same name. Both 'Gollum' and 'Hobbit' are interesting plants with trunks that becomes thick with age and developing interesting stem patterns. This two cultivars has been considered to be identical and people confused one to each other and now plants in the the trade and collection are variously and often improperly named. But whatever named, it's a nice variation on the jade. Habit: It is a small sparingly branched, shrubby, erect, succulent, that can slowly grow up to 50-80 cm tall by 30-60 cm wide. Stem: It has a stout succulent, segmented, branching trunk, it can be shaped to create spectacular bonsai forms. Leaves: Tubular, trumpet shaped, each of them tipped with a "suction cup", 4-ranked (decussate), smooth, deep glossy green in color with very light spotting usually with bright red leaf margins; the new growth is red. Flower: In clusters, small, star-like, white or pinkish-white, with pink stamens. Blooming season: Late fall to early winter. Cultivation: Crassula 'Gollum' is great for container culture and Bonsai cultivation, and the trunk becomes very thick with age and develops interesting patterns. Young plants will quadruple in size in one year only. It need full sun to partial shade and a well-drained soil mix. In the greenhouse use a very draining compost. Plants should be well watered and allowed to dry thoroughly before watering again. Fertilize them once during the growing season with a balanced fertilizer diluted to one half the recommended strength. Must over-winter in greenhouse or indoors (with lots of light). During the winter months, plants are watered only enough to keep the leaves from shriveling. The most common reason for failure in growing these plants is overwatering. Seldom has any diseases only the mealy bugs like it, and tend to attack around the primary flowering time (winter to early spring), hardy to -1° C.
Propagation: It is propagated by leaf and stem cuttings. Offsets are readily available and cuttings roots easily, it also propagate by leaf-cuttings and often leaves fallen/broken off will self-sow at the base. 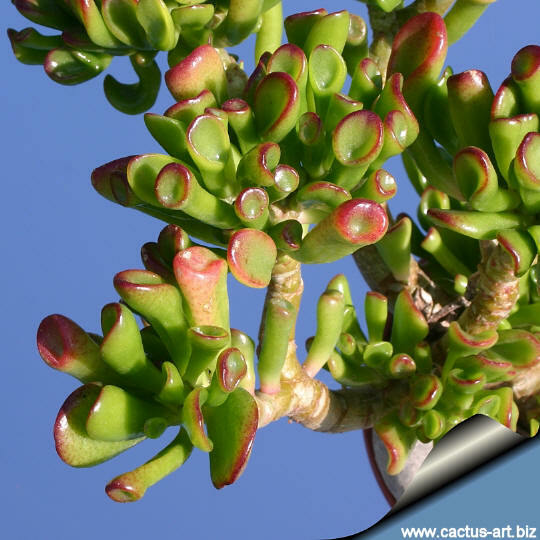 Scientific Name: Crassula ovata (Mill.) Druce cv. GOLLUM Hort. 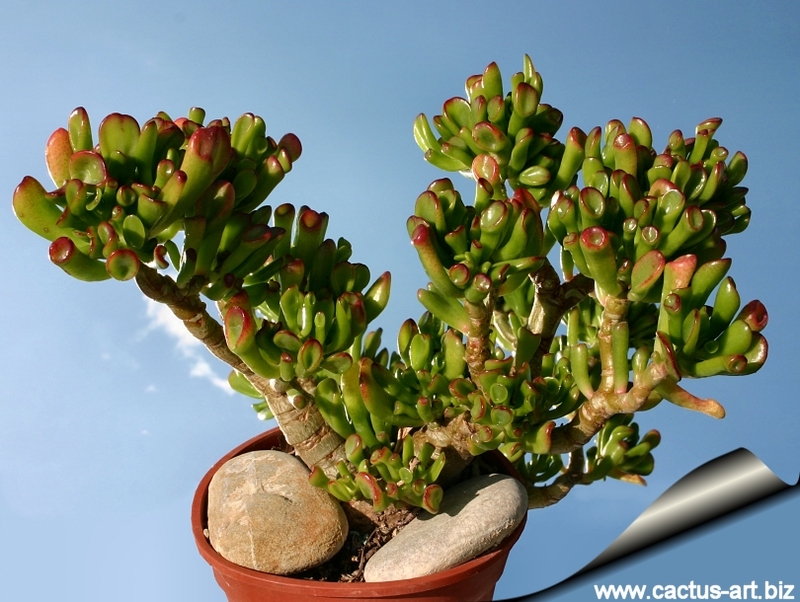 Crassula ovata is also known as Crassula portulacea called jade plant, jade tree. 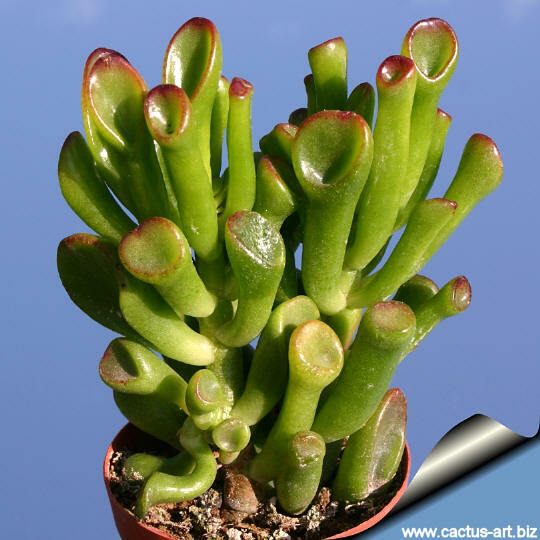 Common English Names include: "Gollum Jade", "Trumpet Jade", "Hobbit's Pipe Jade", "ET's Fingers."